LONDON, England (CNN) -- More than half of children taking antiviral drug Tamiflu suffer side-effects such as nausea, insomnia and nightmares, UK researchers have said. 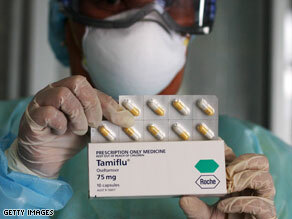 Anti-viral drug Tamiflu caused nausea, insomnia and nightmares among some children studies show. Two studies from experts at the Health Protection Agency (HPA) showed a "high proportion" of British schoolchildren reporting problems after taking the anti-viral drug. Data was collected from children at three schools in London and one in south west England who were given Tamiflu earlier this year after classmates became infected. The studies by HPA experts were carried out in the early stages of the epidemic between April and May, when everyone sharing a classroom with a child who developed swine flu was given the drug, even if they showed no symptoms. Their research, published in the Eurosurveillance scientific journal, looked at side-effects reported by 11 and 12-year-old pupils in one school year in a secondary school in south west England. A total of 248 pupils took part in the study; their school was closed for 10 days after a pupil there contracted swine flu during a holiday in Mexico, researchers said. Seventy-seven percent of these children took the full course of Tamiflu, according to researchers. The report said: "Fifty-one percent experienced symptoms such as feeling sick (31.2 percent), headaches (24.3 percent) and stomach ache (21.1 percent)." One of the studies found that evidence of side-effects prompted UK ministers to change the policy so only confirmed or suspected cases were prescribed Tamiflu. The second study, also published by Eurosurveillance, looked at 103 children. The research found that 53 percent of children at three London schools had one or more side effects. The most common side effect was nausea, with 29 percent of the pupils complaining of this. Another 20 percent of those questioned by researchers complained of stomach pain or cramps, while 12 percent had problems sleeping, the study found. Almost one in five (18 percent) of the children reported a "neuropsychiatric side effect," such as poor concentration, inability to think clearly, problems sleeping, feeling dazed or confused, bad dreams or nightmares and "behaving strangely," researchers said. The UK's Department of Health said in a statement: "The European Union regulatory position remains that no causal association between Tamiflu (or Relenza) and an increase in neuropsychiatric events has been established." Reports from Japan, where Tamiflu has in the past been widely-used against seasonal flu, has linked the drug in rare instances with unusual neurological and psychiatric disturbances in children, according to media reports. Japan is now advising against prescribing Tamiflu to youngsters aged 10 to 19 after its own studies revealed people reporting psychiatric symptoms, according to media reports. A spokeswoman for pharmaceutical company Roche, which manufactures Tamiflu, told CNN: "Abnormal behavior is recognized to occur in patients with influenza virus infection including those taking and not taking antiviral drugs. "Following extensive investigations, no mechanism has been identified by which Tamiflu could contribute to such events. Following a review by an FDA advisory committee in the US, the labels for both Relenza (zanamivir) and Tamiflu have been updated to inform physicians that influenza can be associated with a variety of neurologic and behavioural symptoms."